Occasionally during the past nine years, the topics on Elvis History Blog have been about what Elvis was doing on certain holidays during his life and career. His whereabouts and activities on Christmas, New Year’s Eve, the Fourth of July, and Thanksgiving have been discussed here. So, for my second blog in October this year, Halloween in the Presley universe seemed an appropriate topic. Unfortunately, though, combing through a dozen or so Elvis bios revealed precious little information about Elvis’s activities on Halloween, certainly not enough to fill this blog space. But when I expanded the subject to include the whole month of October, many important events that occurred in Elvis’s life came to light. Below are 13 of them in chronological order. Notice that two of them actually happened on Halloween, and two others just the day before the scary holiday. October 31, 1954 — Backstage at Ellis Auditorium in Memphis, Elvis first made contact with the Jordanaires. He told group member Hoyt Hawkins that he liked the group’s sound and said he’d like to work with them someday. Nearly 20 months passed before Elvis and the Jordanaires first appeared together on the June 5, 1956, Milton Berle TV show. That same month the Jordanaires joined “The Elvis Presley Show” on the road in Atlanta. The group first worked with Elvis in the recording studio on July 2, 1956, for the historic RCA session in New York that produced “Hound Dog” and “Don’t Be Cruel.” The Jordanaires backed Elvis on all of his TV appearances and road shows through 1957 and in studio sessions through 1967. 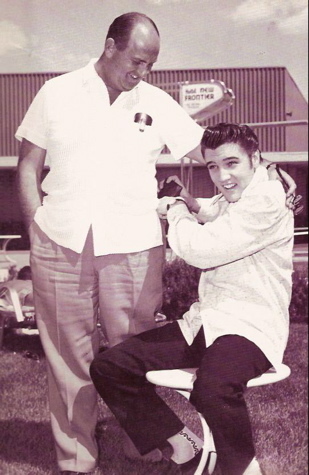 October 20, 1955 — This day Elvis’s parents legally committed their 20-year-old son to a new manager, Colonel Tom Parker. Tom Diskin, on behalf of Parker, provided the Presleys with telegram text, which they were to sign and send to the Colonel. The telegram read in part, “Dear Col Parker, We herby authorize you to act as our sole and exclusive representative in all negotiations pertaining to the recording contract of Elvis Presley … No other person or persons are authorized to represent Elvis Presley in any recording contract negotiations other than Col Parker and we will be bound by your decision as we feel that you will be for best interest of Elvis Presley.” Of course, Colonel Parker remained Presley’s manager for the rest of the entertainer’s life. October 11, 1956 — At the Cotton Bowl in Dallas, Elvis Presley played to an estimated audience of 26,500 at the State Fair of Texas. It was the largest crowd Elvis faced during the hundreds of stage shows he performed in the 1950s. “I’m nervous in crowds,” Elvis said at his pre-show press conference that day. “Sometimes I wish I could get away. Then I get lonesome for the patter of little feet.” One person he couldn’t get away from in the Cotton Bowl was a Dallas County deputy sheriff, who served Elvis with a civil suit summons. The case concerning a personal appearance contract Elvis had signed was later settled out of court. October 28, 1956 — Elvis made his second of three appearances on The Ed Sullivan Show. It was the first time, however, that Sullivan introduced Elvis on his show, as the host was recuperating from traffic accident injuries when Elvis first appeared on his show on September 9. This Sunday night Elvis sang “Don’t Be Cruel,” “Love Me,” “Love Me Tender,” and “Hound Dog.” Earlier in the day, Elvis was inoculated with the new Salk polio vaccine. The next day Elvis shot the new “ghost” ending to Love Me Tender at a movie studio in New York City. October 17, 1957 — Elvis’s third film, Jailhouse Rock, premiered in Memphis. Elvis was not there. After his co-star Judy Tyler died in an automobile accident on July 3, Elvis told a reporter, “Nothing has hurt me as bad in my life. I don’t believe I can stand to see the movie we made together now, just don’t believe I can.” Instead of attending the premiere, Elvis was vacationing in Las Vegas that evening. October 1, 1958 — The USS Randall docked at a German port, and Private Elvis Presley began his 20 months of army service and music industry exile in Europe. He rode a troop train from the port to Friedberg, where he served out his deployment in Germany. 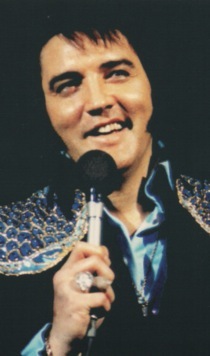 Added to his admitted homesickness were Elvis’s concerns that his fans would forget him while he was gone. With no more TV appearances or movies to keep his image in front of the public, he had legitimate reason to worry. October 31, 1958 — RCA released “One Night”/“I Got Stung” as the first of three Presley singles that would be widely spaced apart while Elvis was out of the country. The success of this first record would be the initial indication of how Elvis’s popularity would hold up while he was gone. Both sides were hits, with “One Night” reaching #4 and “I Got Stung” peaking at #8 on the Billboard’s Hot 100. 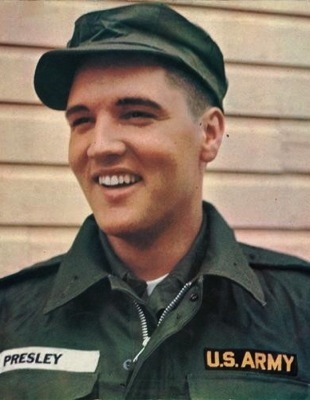 The record sold over a million and half copies, making it Presley’s biggest seller since “Jailhouse Rock.” It confirmed that Elvis’s popularity would remain high during his two-year hitch in the army. October 30, 1960 — In RCA’s Nashville Studio B, Elvis recorded the songs for his first gospel album, “His Hand in Mine.” An impressive company of musicians joined him for the session. In addition to regulars Scotty, Bill, D. J., and the Jordanaires, also on hand were guitarist Hank Garland, pianist Floyd Cramer, and saxophonist Boots Randolph. In four sessions of three hours each, starting at 6:30 in the evening and concluding at 8 the following morning, the group recorded 14 songs. Twelve of them made up the track list of the “His Hand in Mine” LP, which was released the following month. Also recorded during that marathon October session were “Surrender,” which became Elvis’s fifth consecutive #1 single in March 1961, and “Crying in the Chapel,” which reached #3 on the singles chart in June 1965. October 20, 1961 — RCA released the soundtrack album for Elvis’s eighth movie, Blue Hawaii. 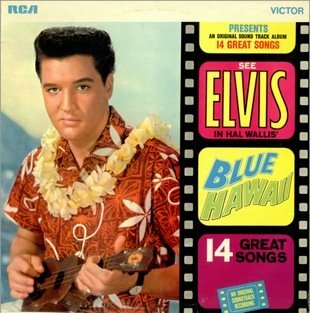 “Blue Hawaii” became the biggest album of Presley's career. It spent 39 weeks in the top 10 of Billboard’s Top Pop LPs chart, 20 of those weeks at #1. In 1961, the LP was nominated for a Grammy in the “Best Sound Track Album or Recording of Original Cast from a Motion Picture or Television” category. It achieved Gold record status in December 1961, Platinum and Double Platinum status in 1992, and triple Platinum in 2002. 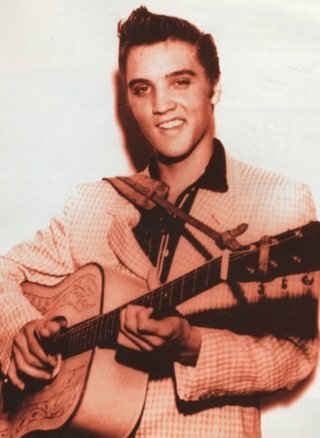 The overwhelming success of the movie and its soundtrack album determined the musical-comedy format for most of Presley’s future Hollywood movies. A number of other important events in Elvis’s life occurred during the month of October. His hit records “Good Luck Charm” and “Return to Sender” were recorded during that month. Elvis’s 28th movie, Live a Little, Love a Little, opened nationwide on October 23, 1968. Elvis and Priscilla’s divorce was finalized on October 9, 1973, at the Los Angeles County Superior Court House in Santa Monica.